Alvin is an Industrial Engineering graduate and was working in the US as an Operations Excellence Leader before relocating for work here in Kenya. Wanting to come back to his homeland, Alvin knew the first thing he needed was to find something substantial to come home to – he needed a good job. Like most Kenyan job seekers, finding a job would not be a walk in the park for Alvin. After going through a series of frustrations and disappointments, he came across a job advertisement that led him straight to Corporate Staffing Services and to the job he has today. Asked about his job search experience, Alvin says, “It was an extremely difficult process, especially because I was still living in the U.S. Employers were not responsive on the job ads that were placed and I was not getting any response to the inquiries I had made on emails. “It was a tedious process that I had to endure for 6 months, but then I approached CSS (Corporate Staffing Services) and all that changed”. So, what made you seek Corporate Staffing for a job? I saw the job advertisement they had, and at that point it was just another ad I had stumbled on, but when i applied i received an email invite for an interview at their office. I was able to schedule a meeting with the recruitment manager to discuss the job opportunity while on holiday in Kenya, and he promised that he was going to bring me back home. He lived up to his promise and that is how I landed the job I have today. What can you tell others like you who would like to come back to Kenya but don’t know where to begin? Just seek the guidance of the recruiters. It will eliminate a lot of head aches and save time and energy. Once the recruiters understand your skills and your value addition potential, they will do the hard work for you and the transition will be much smoother. It’s a process that people in the diaspora are used to, but still in the infant stages in Kenya. Hopefully more employers will start using the services and eliminate the risk of losing out on skilled employees due to misunderstanding. 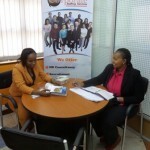 Job seekers in Kenya are skeptical about recruitment agencies, based on your experience, what can you tell them? It’s like a market with willing buyer willing seller but with an agent who knows what your skills are and he / she can sell you to the potential employers. Through recruitment agencies, you meet the right employers who already know what you are capable of and how you will be adding value to their organization. Being called into the interview then becomes just verification for both parties, since the time spent in the hiring process for employers and potential employees has been eliminated in the screening that was already done by the recruiting firm. When asked if he would seek Corporate Staffing Services in a later time, Alvin says, “Most definitely”. Alvin is now in his sixth month at Mobius Motors, Kenya working as a Supply Chain Manager and like him; you could get your job by seeking the services of a recruitment firm either directly or through recruitment personnel. To engage with our recruiters and to get our latest jobs,register your CV details here. I have just read through Alvin’s story. I was a bit sceptical on recruitment agencies in Kenya, but now am willing to try it out. I recently winded my masters in Germany and planning to resettle back home through finding a suitable job. i woud like my cv to be looked into and also get a better job. how can i be assisted? any charges, please inform. Hi. How can you please help me get ajob thru your company? Igraduated last year and am currently lookng for ajob. Am aholder of Bachelor of Science degree-chemistry option. please,am also having the same problem of searching the job.i have diploma in business admin and degree in purchasing and supplies.please help me get a job.